Happy Little Bento: Hello Kitty Onigiri Bento! 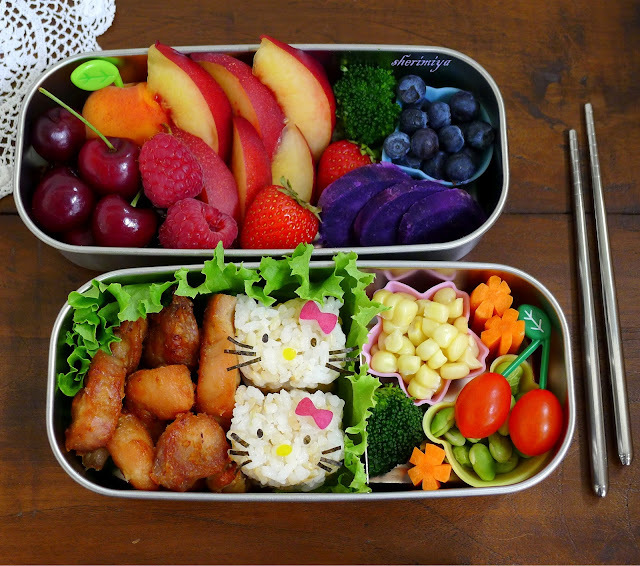 Hello Kitty Onigiri Bento, a photo by sherimiya ♥ on Flickr. Beautiful! I especially like your second tier. The Hello Kitties are so cute!! It's very cool indeed :) ! Your bento is fresh, beautiful and yummy ! It also was one of my favourites ! Thank you so much for your answer. I'm going to decide which compartment (duo, quad) works best for him after he starts bringing bento everyday. I'm not sure what size and what kind is appropriate yet. At least I have an idea now. I have Japanese bento box (Cars 2 and Thomas type stuff) but I think this size is for kindergarten... Thanks again! Even if you didn't make the final 10, this bento is certainly as beautiful as the ones that did. I am completely in awe over you fruit tier. Such vibrant colours. Well done. I really appreciate your kind words, Ingrid. Thank you!! I can't resist her either, but now I have a little girl I can pretend I'm buying all the HK stuff for, heh! Maybe someone has asked this already, but where do you get the Okinawan sweet potato? I've never seen it anywhere before (I live in South Florida). Am I out of luck? My kids both love the purple carrots and I know they would love this too! Okinawan sweet potatoes have a white skin and look more tapered, like other sweet potatoes. Good luck! It's gorgeous Sheri! I would've voted for you :) The colors in this one are so rich and deep, love it! Thank you so much Heather! SO sweet! Adorable, fresh, and gorgeous! This one gets my vote!! I got 2 votes! Thank you Jenn!! Hello !!! :) Your bento looks amazing !!! It's colorful, classy and cute at the same time. And the photo is very beautiful as well !! I wish i could take photos like you :). I would eat your bento straight away, hahah ! This chicken looks super appetizing, i wonder what "mochiko chicken" is... And the fruit part is also awesome :) I do not pack fruits in my bento as often as I should... I'm always scared that they will get all soggy when i get to lunch time ! I like your metal box :). I thought about buying one because i think that they really make the food look nice... but i'm not sure that i would get used to eating cold, as they don't go to the microwave ! Did you get used to eating cold lunch when you started bento ? Or were you used to it even before ?? :) I'm going to look your other pages, yaaay many beautiful bentos to discover :) ! Thanks a lot for your enthusiasm Kelyrin! I posted the mochiko chicken recipe in the blog ( if you do a search in the search box you'll find it), fruit will not leak if you put it in a separate section or silicone food cup, and cold / room temp bento can be very refreshing and delicious! My kids enjoy it a lot. So happy that you've stopped by with your sweet comments! I think my favorite part is the radish bows. Really great job! 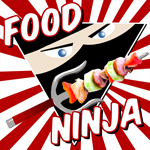 And thanks for sharing the contest--it really is amazing what so many people are doing with food these days. Thank you SFD! I like the radish bows too; they came out very clean and precise. I love looking at all the entries; they are so inspirational.